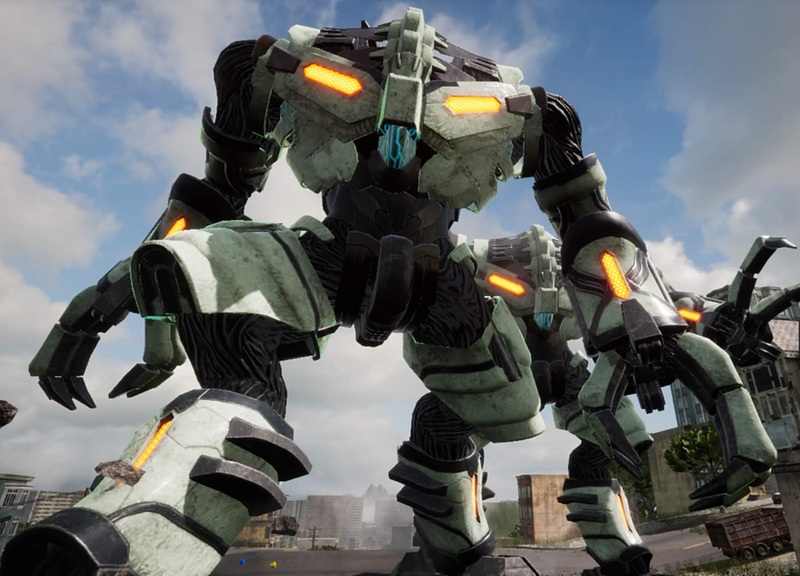 But Earth Defense Force: Iron Rain, the latest in the publisher's premier franchise, is something different entirely. This game is genuinely good. The first thing that struck me from the TGS demo was how impressive the character and enemy design were. 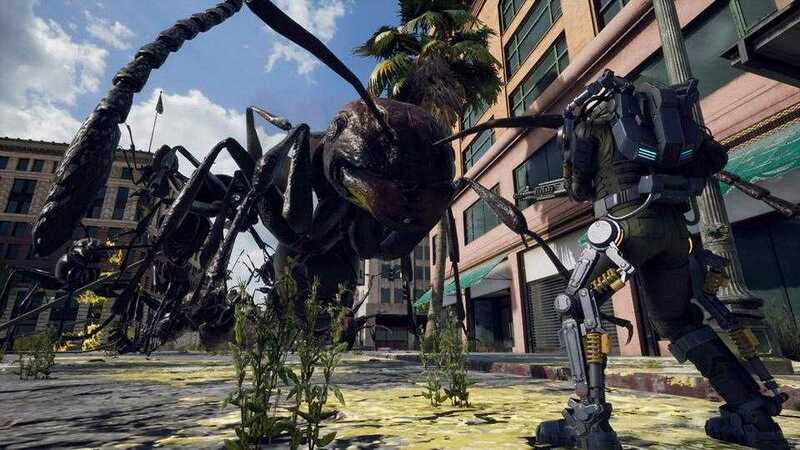 As with all Earth Defense Force games, the principle point is that you're battling large swarms of enemies, and in previous EDF titles that would mean the enemies were barely animated or detailed. Iron Rain guns for a higher standard entirely. At the start of a mission you're treated to a close up of your character, which shows some impressive level of detail, and then you're set against hordes of enemies, which are themselves impressive in how they move around, attack, and threaten. Coupled with the truly giant robot enemies that I got to fight in the demo, EDF for the first time manages to push past a pure B-grade humour of its early-monster-cinema-inspired predecessors and genuinely make you feel like a small human being beset from all sides by giant monstrosities. It's still absolutely a deliberately bad monster film in game form, but it was genuinely thrilling. Something you would want to play with friends not just because it gets funnier the more beers that you have, but because it offers good quality action. Characters control smoothly, too, and all the quirks that fans learn to come to grips with with Earth Defense Force - a less-than-disciplined camera, for example, or janky movement or weapons management, has all been brought under control. It almost seems like D3 Publisher and its development team sat down and put some effort into learning what makes for a tight shooter, and Iron Rain is the result of that. Environments are fully destructible as in games past, but before they've been levelled by the action, they are less nondescript boxes and more interesting bits of architecture. In the rare quiet moment that the Iron Rain demo provided me I actually had a really good time looking around. And, while I only got to play the one mission, it was more layered than I was used to in EDF; in previous games you would generally have a single objective, and often one, perhaps two enemies to fight in achieving that objective. You'd need to fight off a couple of waves of ants, for example, or a alien spaceship spitting out fliers. With the Iron Rain mission I got to play, it started out with a wave of big ants, before an attack of giant robots, and then a swarm of hideously massive cockroach-things. Either the TGS demo picked out the very best mission in the game to play, or Iron Rain's typical mission ranks in equivalent standard to the best missions in previous games. 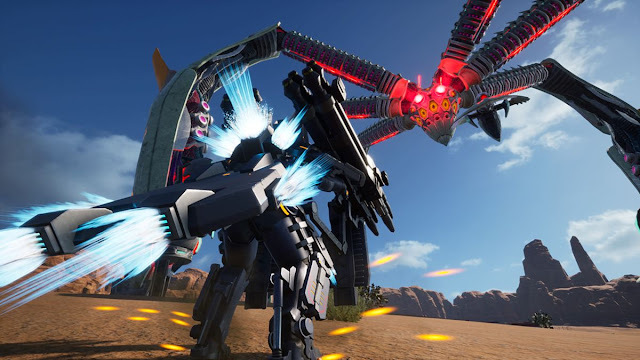 Make no bones about it, Earth Defense Force: Iron Rain keeps the franchise's traditions alive; it revels in B-grade hilarity, and it's not about to become a deathly serious shooter franchise. But the production values are genuinely impressive, and the action has tightened to the point that this may well be the first D3 Publisher action game that you could love for its action and gameplay, rather than despite it. I cannot wait to get my hands on the full game with this one.